Forget about the Houston Rockets and James “The Bearded Wonder” Harden’s insane scoring run. Don’t worry about the ongoing Anthony “The Brow” Davis trade saga in his effort to wave farewell to the New Orleans Pelicans and the Crescent City. I’ll be the first to tell you that these are great storylines filled with plenty of intrigue, but let me provide you with a shift. The Golden State Warriors (38-15) once again look the part of the Orange Roundball League’s juggernaut. Even with the Denver Nuggets on the rise out West, the Warriors have hit the throttle to stand alone in The Association. Looking out East, the Toronto Raptors, Milwaukee Bucks and Boston Celtics can’t touch them either. Not only have they found a ridiculous groove, but they’ve also added DeMarcus “Boogie” Cousins to the mix without a glitch. In my eyes, Boogie is easily among the top-five frontcourt players in the NBA. A perfect match with the Warriors, Mr. Cousins seems to have juiced the back-to-back champs to another stratosphere. After suffering a torn left Achilles tendon on January 26, 2018, as a member of the Pelicans, DeMarcus has finally mended. Boogie debuted as a starter for Golden State against the Los Angeles Clippers at Staples Center on January 18, 2019. Nearly a calendar year later, Cousins dropped home 14 points, snatched six rebounds, and even shared the orange with three assists in just 15 minutes on the floor. 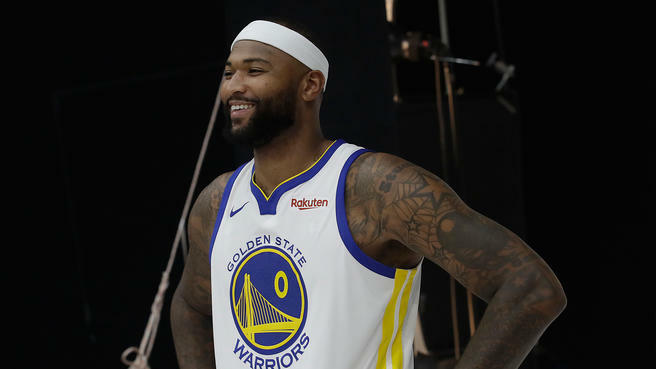 Standing 6-foot-11 and tilting the scale at 270 pounds, DeMarcus has utilized those assets well as a member of Dub Nation. All-in-all, I think 14.4 points, 7.3 rebounds, and 4.0 assists per game since his return isn’t bad. No kidding. I’m impressed. No attitude or chemistry issues in the Bay Area. With a history of having a bad attitude and being a poor teammate while with the Sacramento Kings, Boogie has changed his tune. Having the Splash Brothers (Stephen Curry and Klay Thompson), Kevin Durant, Draymond Green, and Head Coach Steve Kerr in your corner certainly help. Cousins & Co. look to keep the Warriors’ rolling. Nobody wants to face these studs right now. Randy this is a great article. I like the way you reflected on how DeMarcus “Boogie” Cousins has the opportunity to play with some talented players who recognize his skill and work to be an awesome top notch team.